contains pretty fiddle tunes and some songs. And a message. Actually several messages, but the main one is the last song - Good News. One person found this CD melancholy, another very optimistic (yey!) another said it was about transormation, other found many moods in there, some wrote it is amazing (many thanks!). It comes in a handmade cover, a kind of a hexagon opening to a triptych. There were no synthesizers or drums killed, damaged, hurt or used in making of this. I had a lot of fun making it, but than I a have a lot of fun anyway. I know I know, I should be a deeply suffering artist, but that would be such a bore. There will be videos on YouTube for some, or all the songs and tracks. available from aranos.org at € 18.- (or whatever you like) including postage. Downloads should be on iTunes, spotify and such, if you want them free you can pull them from aranos.org, or contact me I’ll send them to you. Donations welcome but not necessary. 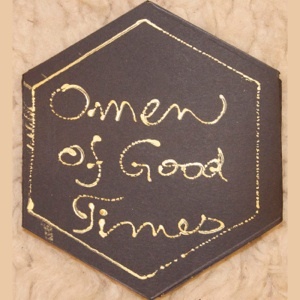 Aranos, "Omen of Good Times"
This latest release from Aranos is an especially unusual one (even within the context of his already singular discography), as it is a varied suite of songs exploring the twin themes of mortality and joie de vivre. It has always been clear that Aranos knows a thing or two about living an interesting and vibrant life, but it is worth noting that he has also technically died once (and been resuscitated) as well, so he has some perspective on that side to offer as well. While it is the subject matter than ostensibly brings all of these songs together, the most immediate and striking feature of Omen of Good Times is its prevailing mood of eccentric, cockeyed fun: there are few shades at all of Aranos's more experimental leanings here, just a one-of-a-kind raconteur/performer channeling everything from Eastern European folk music to religious spirituals to swinging Django Reinhardt/Stephane Grappelli-style string jazz. Like most people, I first became aware of Aranos though his early collaborations with Nurse With Wound, though that awareness did not go much deeper than noting that Acts of Senseless Beauty had some violin on it. Neither that album nor Santoor Lena Bicycle made me particularly curious about Aranos's solo work might sound like. Both albums were good, of course, but I casually attributed that success to Steven Stapleton's imagination and collaging abilities. Much later, however, I wound up hearing some of Aranos's solo albums. I also saw him live and was pleasantly bewildered to discover that he is quite a mesmerizing character and a legitimate iconoclast. Knowing what I know now, it actually seems crazy that Aranos is best known for his experimental, abstract collaborations: the raw, spontaneous, and undiluted Aranos is far more strange, memorable, and unpredictable. For better or worse, I consistently have absolutely no idea where Aranos is coming from or what his latest album will sound like. The twist is not that he is making unimaginable, otherworldly sounds, but rather that he seems superhumanly sincere and unselfconscious, as well as blissfully unstuck in time. Case in point: aside from one song, Omen of Good Times could easily have been recorded in the 1930s. As far as his relation to contemporary trends in music is concerned, Aranos may as well be from another planet. Perversely, I tend to like Aranos's actual music the most when he is in "Gypsy violinist" mode, such as on the jauntily lyrical waltz "Dring of Stars" or the more sadness-tinged "Hawthorn Blossom." That is not where Aranos is truly unique, of course, as I probably could not walk a block in Romania without tripping over another violinist equally well-versed in similar fare. Rather, Aranos's more substantial musical gift lies in how many different styles he has absorbed and how effortlessly he seems to filter them through his own skewed sensibility. Sometimes the results can admittedly be a bit perplexing, as on the almost-barbershop-esque/Triplets of Belleville-like crescendo of "Going Downhill" or the near-musical theater "dig a hole, dig a hole, dig a hole" interlude in the otherwise beautiful "Build Me a Coffin." The latter is an especially fascinating example of Aranos's chameleonic artistry, as he also veers into croaking torch song and an elegiac falsetto chorus of multitracked voices (all his) along the way. Elsewhere, he delves into spirited tango ("Contact Penumbra") and a number of bouncy Reinhardt-esque jazz forays with varying degrees of eccentricity and unexpected eruptions of vocals. The true heart of Omen of Good Times, however, lies in its two fully formed songs, "Just Around the Corner" and “Good News.” While certainly charming and catchy, both are far more significant for their lyrical content: Aranos genuinely wants to make life better and offers plenty of helpful advice in that regard. Also, he thoughtfully reminds us all that we are divine in the lurching, tender, and fluid closer. That is quite a rare feature for an album to offer. While it is not perfect by any means, Omen of Good Times is unquestionably quite ambitious in what it sets out to achieve and quite wonderful and singular when it achieves it. At its worst, it is merely entertaining and a little confounding. For example, I do not understand why an abstract experimental piece like "Bread Machine" wound up here, nor do I entirely understand why some songs end abruptly or spontaneously erupt into vocals. Aranos can certainly be an enigma, albeit quite an endearing and irascible one. In fact, he seems a lot like an archetypal character that belongs in old grindhouse Kung Fu films, something like a laughing monk that initially seems like comic relief, but who is ultimately revealed to be the wisest person in the entire town. As such, he can be quite inscrutable, somewhat scattershot, and a bit hammy, but he never boring and he is always very much himself. As cliché as it sounds, Aranos's life is the real art and Omen succeeds primarily because it offers one of the clearest windows into that life. As such, Omen is best viewed as something akin to a freewheeling and anachronistic one-man cabaret show, passing through some weird detours and tonal shifts along the way, but cumulatively adding up to a powerful, guileless, and sometimes moving portrait of a truly unique artist.